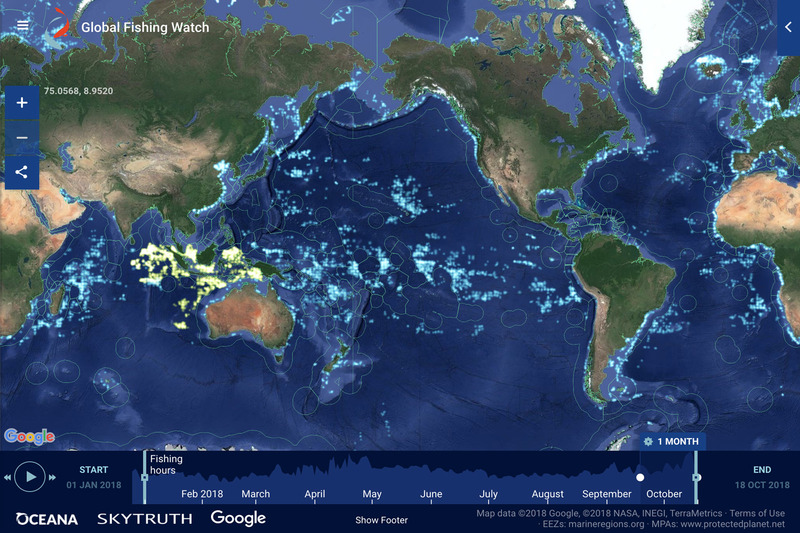 Today, we are releasing an updated version of the Global Fishing Watch map that is easier to use and includes several new features. It also increases your ability to customize the map view. This update comes in response to some great feedback we’ve been getting from our community. Import custom polygon layers within Global Fishing Watch. Global Fishing Watch now supports import of GeoJSON polygon overlays. You can import a custom layer and, if you’d like, share your workspace. For instance, if you want to illustrate the fishing activity that occurs within and around a proposed MPA, you can import the MPA boundary into the Global Fishing Watch map, style it, and share the resulting map with others. In the map toolbox, select Layers -> Add Layers -> Custom Layers to get started! See our FAQs for how to use this new feature. Zoom at non-discrete levels and tilt your map view. This allows you to zoom in a more natural way using a mouse wheel or touchpad. The level of zoom can now be saved in the workspace in a much more precise way, allowing you to target very specific areas. Updated WDPA Protected planet MPA includes ALL MPAs from Protected Planet. Updated MPA No Take: includes ‘no take’ MPAs extracted from WDPA. Updated MPA Restricted Use: includes ‘restricted use’ MPAs extracted from WDPA. Customize your static layers with color, opacity, and labels. We hope you enjoy these updates. Visit the map to get started!